This story appears in the May 2 print edition of Transport Topics. 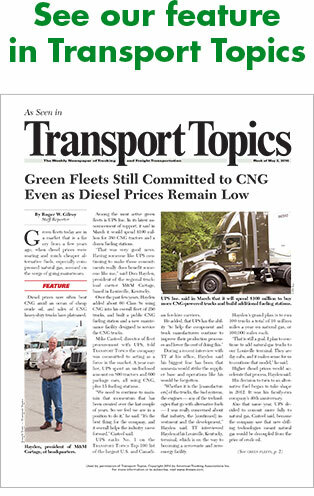 Green fleets today are in a market that is a far cry from a few years ago, when diesel prices were soaring and much cheaper alternative fuels, especially compressed natural gas, seemed on the verge of going mainstream. Diesel prices now often beat CNG amid an ocean of cheap crude oil, and sales of CNG heavy-duty trucks have plateaued. Among the most active green fleets is UPS Inc. In its latest announcement of support, it said in March it would spend $100 million for 380 CNG tractors and a dozen fueling stations. “That was very good news. Having someone like UPS continuing to make those commitments really does benefit someone like me,” said Don Hayden, president of the regional truckload carrier M&M Cartage, based in Louisville, Kentucky. 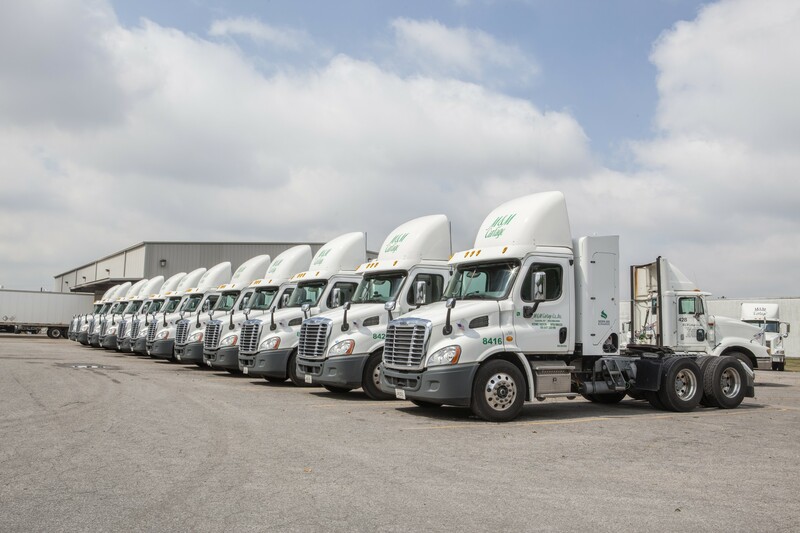 Over the past few years, Hayden added about 60 Class 8s using CNG into his overall fleet of 250 trucks, and built a public CNG fueling station and a new maintenance facility designed to service the CNG trucks. Mike Casteel, director of fleet procurement with UPS, told Transport Topics the company was committed to acting as a force in the market. A year earlier, UPS spent an undisclosed amount on 800 tractors and 600 package cars, all using CNG, plus 15 fueling stations. “We need to continue to maintain that momentum that has been created over the last couple of years. So we feel we are in a position to do it,” he said. “It’s the best thing for the company and it overall helps the industry move forward,” Casteel said. UPS ranks No. 1 on the Transport Topics Top 100 list of the largest U.S. and Canadian for-hire carriers. During a recent interview with TT at his office, Hayden said his biggest fear has been that amnesia would strike the supplier base and operations like his would be forgotten. “Whether it is the [manufacturers] of the trucks, the fuel systems, the engines — any of the technologies that go with alternative fuels — I was really concerned about that industry, the [continued] investment and the development,” Hayden said. TT interviewed Hayden at his Louisville, Kentucky, terminal, which is on the way to becoming a zero waste and zero- energy facility. Hayden’s grand plan is to run 100 trucks a total of 10 million miles a year on natural gas, or 100,000 miles each. “That is still a goal. I plan to continue to add natural gas trucks to our Louisville terminal. They are day cabs and it makes sense for us to continue that model,” he said. Higher diesel prices would accelerate that process, Hayden said. His decision to turn to an alternative fuel began to take shape in 2012. It was his family-run company’s 40th anniversary. Also that same year, UPS decided to commit more fully to natural gas, Casteel said, because the company saw that new drilling technologies meant natural gas would be decoupled from the price of crude oil. For M&M Cartage then, it was either contract or expand. It had come through the Great Recession, was debt free but revenues had plummeted by 40%, Hayden said. “We were not going to survive where we were unless I made some changes,” he said. Crude oil was trading at about $100 a barrel. The national retail average price for diesel fuel during 2012 set a record high of $3.97 per gallon, and the fuel had remained above $3 per gallon every week, according to the Energy Information Administration. “I asked myself, ‘What do the next 40 years look like?’ ” Hayden said. He made the leap, and bought one — a Freightliner M2 with a Cummins 9-liter 300 HP engine. Hayden also has terminals in Indiana, Michigan, Ohio and Tennessee. Meanwhile, Casteel said UPS does not have data to share on the number of contracts it has won, if any, based on its use of alternative fuels. “What I can tell you is that more and more [requests for proposals] from potential customers are asking about our sustainability initiatives as one of the conditions of doing business with us,” he said. Another fleet, Matheson Trucking Inc. said in March it added 25 new CNG and 12 liquefied natural gas tractors to its fleet as part of a clean energy expansion program. The program is designed to improve air quality, lower greenhouse gas emissions and decrease diesel fuel consumption on routes served by the Matheson Postal Services Division, whose contracts were up for renewal. Looking ahead, the industry will sell roughly 9,000 natural gas heavy-duty trucks in 2016, up minimally from about 8,500 in 2015, BB&T Analyst Rhem Wood wrote in a summary of discussions held during BB&T’s transportation conference. According to the trade association NGVAmerica, sales in 2013 were only 6,700 units, but then rose 30% to 8,700 in 2014 before hovering at about that rate in 2015. “The natural gas heavy-duty truck market continues to grow at a snail’s pace,” Wood wrote. UPS’s Casteel said natural gas is the alternative fuel that has the biggest application to the Class 8 fleet. UPS usually keeps its tractors for about 12 years, and that means it buys 1,000 and 2,000 tractors every year as part of normal fleet turnover, he added. “Since 2014 through 2016 we have bought just over 4,000 tractors and the majority, probably about 55%, have been natural gas, either CNG or LNG,” he said. Wood wrote that current forecasts call for the adoption rates to increase by 5% in 2017, 10% the year after, 17% in 2019 and 23% in 2020. He said his experience going green has been an all-encompassing effort. “We are trying to do that in a very responsible manner and hopefully kind of being leaders in that and how do we align ourselves with customers that want to do the same, with vendors who have those same goals and like mindsets,” Hayden said.